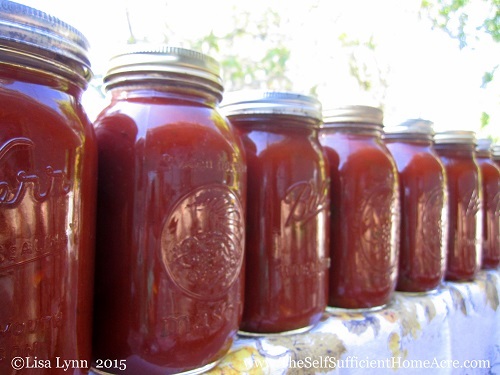 My tomatoes finally started producing enough fruit to make a batch of sauce…woo hoo! Unfortunately the weather is cooling down so I will probably only have enough to make one or two more batches this fall. Homemade spaghetti sauce tastes so wonderful that I’m feeling just a little cheated. I recently purchased a Victorio food strainer and used it for the first time with these tomatoes and I must say that it worked much better than my food mill (also known as a Foley mill). It made pretty short work of my tomatoes, and it was on sale…bonus! Remember to add 1/2 tsp citric acid or 2 tsp lemon juice to each quart jar of sauce to be sure that acid level is high enough for water bath canning. This recipe makes approximately 9 to 12 quarts of tomato or spaghetti sauce, depending on what variety of tomatoes you use and how long you cook it down. Handy Tip: To reduce cooking time, you may add tomato paste to sauce to thicken it. The more tomato paste you add, the shorter the cooking time and the larger the batch. Tomatoes ripening in a box. I have about 60 pounds of tomatoes for my next batch of sauce. A boiling water bath is the recommended canning method for preserving tomato and spaghetti sauce. Because many varieties of tomatoes are not high enough in natural acids, you should add citric acid or lemon juice to the sauce, as directed above. Notes: I didn’t use tomato paste to thicken my sauce. Instead, I cooked it for about 24 hours. Considering the cost of our electricity, we estimated that it cost around $1.30 to cook the sauce and can it. However, if your time is limited or you would like to get as much sauce as possible from your tomatoes, you may wish to add tomato paste and cook for a shorter time. I added peppers, onions, garlic, and basil from my garden and Pizza Seasoning from Frontier Herbs, as well as organic sugar. My large boiling water canner holds 9 quarts and I had about 2 extra quarts that I used to make dinner. Brown turkey and add vegetables. Cook until veggies are tender. Add tomato or spaghetti sauce. (If using plain tomato sauce, add 3 Tbs sugar and 3 Tbs Italian seasoning, or to taste.) Turn burner to low and cook and stir for about an hour. In separate pot, cook pasta according to package directions. Drain. Spoon pasta onto plate and top with spaghetti sauce and grated cheese. Do you make your own homemade tomato and spaghetti sauce? Do you freeze or can your sauce? Can I use this method of canning if I add meat to the sauce? Thank you for your question. It is not safe to can this spaghetti sauce with meat in a hot water bath canner. If you would like to make sauce with meat, use a pressure canner or freeze the sauce instead. Lisa, I just made the first batch of spaghetti sauce but I used one onion, and just one cup of sugar. It seems sweet. I think I’ll cut down the sugar even more. Tried the pasta sauce recipe but used only one onion, and just one cup of sugar. It seems too sweet still. I think that the next time I make it I will reduce the sugar too. A lot of it is personal taste. I hope you can choke it down! 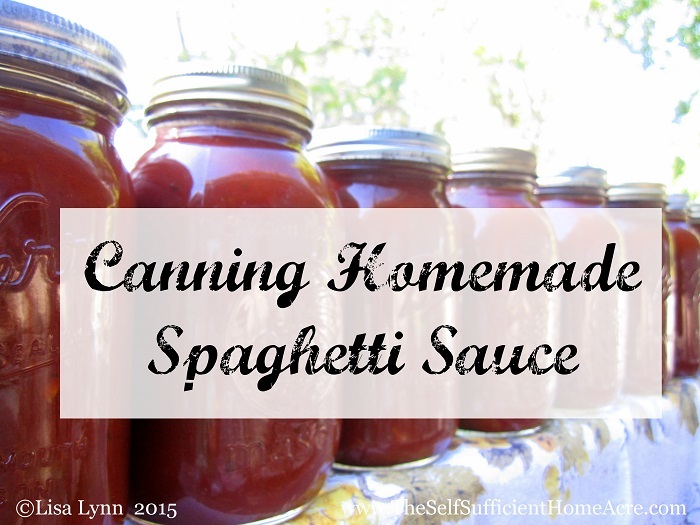 My husband and I canned about 40 quarts of homemade spaghetti sauce a couple weekends ago…. It is super rewarding to finish up and look at all the beautiful jars full of yummy sauce just waiting to be gobbled up…. We use tomato paste and tomato sauce in addition to fresh tomatoes. Depending on how thick you like you sauce (we like it pretty thick). We used 4 gallons of paste, 4 gallons of sauce, 4 gallons of water and 5 lbs of fresh tomatoes diced and simmered with the meat. We added approx. 20 lbs of ground beef/venison. We mix all this up in 2 huge pots and let simmer for about 30 minutes. We added 2 cups of ground garlic, 1 cup parsley, 5 bay leaves, 1 cup sweet basil, 1/2 cup salt, 1/8 cup black pepper (per pot). Then we add just a bit more water to keep the consistency we like and let simmer for an hour. We then ladle the hot sauce into prepared quart jars and add the lids and rings. We pressure cook ours for 20 minutes with 10 lbs pressure and tada…..!!! All finished! Of course we usually have just enough left over to have dinner, who can pass it up after smelling the fantastic aroma all day long? Your sauce sounds delish! I bet you really enjoyed dinner when you were all done! Meant to ask you if you could tell us how to make our own tomato paste? What do you have to do to get it so thick? I’m hoping to share a short post on tomato paste tomorrow. Today is super busy, so we’ll see if I can get that up in time. But, basically, you need to keep cooking down your tomato juice/sauce until it is very thick. It takes quite a bit of time to do that, but it’s really nice when you’re all done. Can you share with us your Amish recipe for making ketchup? I’d love to try that! Great post! 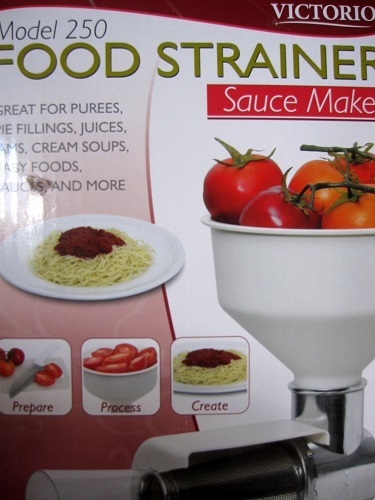 Also thanks for the review on the strainer! Please don’t laugh but as I said from the very beginning, I’m a “greenhorn”……just about as “green” as one can be……lol Anyway, I was disappointed because you told everything in your original post except for how long to cook it and at how much pressure! Then I read your response to Vickie’s post regarding when canning it with meat. In that post you did tell us the cook time and at how much pressure. So now I am confused. So do you mean you can…….. can veggies, (in this case spaghetti sauce), WITHOUT using a pressure cooker and it is called a: “water bath”? How does it seal without the pressure? Also, what need is there for ever using a pressure cooker, if you don’t have to have one in order to can things? Because, like you said, it does take awhile waiting for the pressure to go down before you can proceed again! Well, as long as I am showing how “green” I really am here……lol……I may as well ask you another question……How long do you need to leave the jars in the “boiling water bath” to ensure they are sterilized? Also, how long for boiling the screw rings for the lids? Don’t you also need to boil the lids to sterilize them? Or was that just a “typo” that should have read, as the 3rd bullet: “•Sterilize screw bands AND lids”? (Instead of FOR lids)? Or do the “Lids” NOT need to actually “BOIL” at all and it IS the “step” for sterilizing the “lids” to just: “•Dip out a small amount of hot water into a bowl and place canning lids in water”? (I didn’t know if this was a separate step “AFTER BOILING” the lids, just to keep them like….”warm” and therefore, pliable enough……so they would remain warm rather than being cold, so that they would seat/seal right but not burn your fingers when you went to pick one up? Or, if just placing them in a bowl of hot water was enough to sterilize them? Never heard or tasted spaghetti sauce with using the eggplant in it. It sounds yummy! I made some spaghetti sauce one time using already steamed up and chopped small, broccoli florets. I learned this from a friend of mine who was a vegan but who oddly enough, did not like to use tofu for her meat substitute. Once you start eating it with the broccoli added, the lack of meat isn’t noticed due to the consistency of the tiny broccoli florets in there. Oh, I nearly forgot……I wanted to ask about cooking the sauce for 24 hours, (if you don’t use any tomato paste)……How do you keep it from sticking and burning on the bottom of the pan while you are sleeping and therefore not “stirring occasionally”? In my post, under ‘How to Make Your Own Tomato Sauce’, the last step lists the canning instructions…Process in a boiling water bath for 40 minutes. Processing means to put your filled jars with lids into a canner of boiling water, bring back to a boil, and boil for 40 minutes. The new canning lids that I use do not recommend boiling the lids…it can cause disintigration of the rubber sealant if boiled too long or too hot. I still put mine in hot, not boiling, water for just a minutes before placing on the jars, just because it makes me feel better. But for information on the lids that you are using, go to the manufacturer’s website and follow their instructions. The site that I listed above does not instruct you to boil the screw bands, but I still do that for about 5 minutes before placing on the jars. This is all if I am canning using the boiling water bath method. If I am pressure canning, I don’t put the lids in hot water and I wash the screw bands but I don’t boil them. Sterilizing jars…the site listed above instructs you to sterilize jars for jams and jellies that are processed in a boiling water bath for less than 10 minutes. To sterilize the jars, boil for 10 minutes. For high acid foods that will be processed for more than 10 minutes it is not necessary to sterilize the jars first…which I guess I forgot about that. I always put my jars in the canner, add the water, and bring it all to a boil. I leave the jars in the boiling water until I am ready to fill them. I guess I am ‘erring’ on the side of safety! To cook your sauce for 24 hours (give or take, depending on how thick you want it) you will need to use a stainless steele pot with a nice, thick bottom. Turn your burner to low once the juice/sauce gets nice and hot. I do get up several times during the night to stir, but if you have the heat low and the pot has a thick bottom, you shouldn’t need to. I like my spaghetti with all kinds of veggies. The eggplant is optional…I should have mentioned that. 🙂 Broccoli is great cooked into spaghetti sauce. I hope I answered all of your questions. I know that the site that I shared has a wealth of information that will be useful to you. I hope you can check it out and have any additional questions answered. Good morning, Lisa Lynn! My tomatoes were late this year also! A weird growing season. Anyway, I made pasta sauce with ground meat in it last year and then pressure canned it. It was delicious! I don’t think I will have enough tomatoes for much sauce at all this year. Bummer, Oh well. Thanks for your review of the Victorio food strainer – I need to buy one! Have a great week! Your pasta sauce with meat sounds yummy 🙂 I thought about making my sauce that way, but hated to pull out the pressure canner this time. Mine only holds 7 quart jars and it needs to sit for so long to reduce the pressure once it is done processing that I usually only do one canner full each day. Otherwise I’m up until the wee hours of the morning…and that is too much for me nowadays! Glad that the info about the food strainer was useful! Does this process equally as well without the sugar? Not only does my husband hate ‘sweet’ pasta sauces, we are trying to reduce and eliminate as much white refined sugar from our diets as we possible can. I have been searching for a really good tasting pasta sauce recipe without sugar. That’s not been an easy task. Thanks! I completely understand your desire to reduce sugar in your diets! This spaghetti sauce doesn’t taste sweet, the sugar really just makes it taste less acidic…but you can certainly eliminate the sugar without any problems. It isn’t necessary to make the sauce safe for water bath canning. If you try this and feel that the sauce needs a sweetener to make it taste less acidic, you could try honey to replace the sugar. Just use about 1/4 the amount and add more if you think it needs it. I use the organic sugar because, well, it’s organic, and it is also much less refined than the regular white sugar from the store. Let me know if you try it without the sugar and how you like it! I froze some for the first time this year (because I didn’t really have enough to can). Great post! Good for you, Lori! I am completely out of freezer space now…one of our freezers died on us last week and I had to toss out a bunch of veggies in order to save all of the meat. 🙁 But I should probably learn to live with 2 freezers instead of 3 anyway!